For those of us that have grafted seedling trees or have purchased pre grafted trees, I often get the question of when do I prune off the blooms or flowers? I used to recommend that you prune off the panicles when the flowers or fruit are pea to marble size but I was wrong. It gets a lot more technical and the flowering article I linked to at the top of this thread explains the science in detail. In simple terms, you should prune off the panicles when the (average)temperatures are above about 65-66F. At around 63F, you will get partial blooms and at 59F, you will get full blooms. Looking 10 days ahead according to Weather.com, my average daily temp has now reached at or above 66F; so, should I go ahead and cutoff this one pannicle holding 2 fruits that size? Its on Laverne's Manila, about 9 ft tall, first year bloom with 2 years Maha scion (thanks Warren). The only other panicle on the tree has 1 fruit -same size- . Thanks for your advice Simon! Sam, those are pretty good sized fruit already and based off your information, I would just let them grow and ripen. A 9 foot tree is considered pretty good sized and the Manilla rootstock should do well for you. It's still really cold where I'm at and my mangos are tiny, only about marble sized although I removed the initial fruit set a while back at the risk of re blooming. Most the trees where I removed the initial blooms have now re bloomed. I wanted to go against my own advice just to make sure. Ok, I'll let them grow and ripen; thanks for your advice and explanation Simon and Shinzo! I have found that mangos do exceptionally well in so cal. I have been able to grow and produce fruit every year consistantly.i have a Carrie mango, and and unknown fiber free variety in the ground. I also have a Coconut Cream, Ice Cream, Irwin, and Cotton Candy mango ready for ground planting next year. I have fouund mangos to be exceptional, reliable trees in this climate. Very hardy. How many years were your trees in the ground before they started producing (and you let the fruit mature)? Both of those trees productive in the second year after i planted them. The yield is different every year. Last year, the unknown had so much fruit on it, it bent the tree down. This year, the unknown only produced a very small batch of 6-8 mangoes. The Carrie traditionally has held a small number of fruit. The tree is a dwarf, and it has decided to take a horizontal growth habit, and It stands about 3 feet tall. i am from San Diego originally and am now in Florida in the Mango tree industry and this a 2 cents you may want to evaluate. Chris Rollins told me about issues with mulching in winter, you guys are really dry in summer and need mulch to keep in water but in winter mulched trees get more cold damage due to mulch insulating them from the heat escaping the ground at night and the ground warming during the day. In FL non mulched trees fair better on cold nights than mulched trees. Sharkman, thanks for the information! I recall hearing or reading about this somewhere else. I guess the mulch is such a good insulator that it blocks the suns rays from hitting the soil and warming it in the daytime. The best practice would probably be to rake away the leaves in the morning so that the sun can warm the soil and then rake back the mulch at night to hold in the heat. I believe this will probably be too much work for most gardeners so if one has to pick whether or not to use mulch, I would still recommend mulching. I guess if one were growing in the coldest marginal areas for mango, it would be best practice to clear the mulch on mornings where extreme cold is anticipated that night or the following morning as long as they remember to rake back the insulating mulch that evening. Thanks again for that useful information! I found a list of cold hardy mangoes that are grown in Egypt. Most Egyptian mangoes are grown in Al Ismailia which has similar climate to Socal. Do you want me to translate that list to English ?. Yeah sure, that would be great but I'm not a big believer in cold Hardy mangos. The research I've done over the last several years has shown that cold tolerance was mostly a factor of the size of the tree with older, larger trees being more resistant to cold weather. 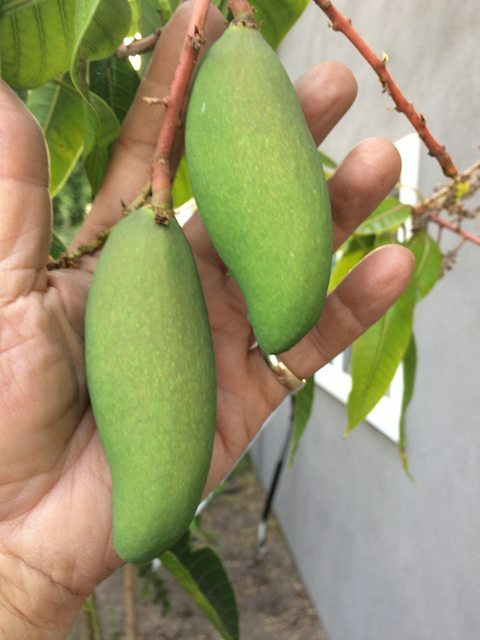 In regards to growing Mango and other tropical/subtropical fruit trees in SoCal, a member here pointed me towards a few articles that has great explanations on why the old way of planting our fruit trees was flawed. These articles from Laguna Hills Nursery are excellent and have great explanations. According to the Egyptian lecture, cultivars with Long and thick leaves have a better chance to withstand cold weather than mangoes with small and thin leaves. here is some of the cultivars that can handle cold (better than other cultivars that are grown in Egypt). زبدة - تيمور - محمودى - بايرى - قلب الثور - كوبانية - عويس - مسك - لانجرابنارس - فجرى كلان - والى باشا . You don't want to rake it back because it will only hold the heat in for the roots, you need it to release the heat so it will create a mico climate as the heat rises around the tree. Only keeping the roots warm will not help the main body of the plant when it is very cold. Won't raking the leaves back at dusk lock in the heat captured during the day and slowly release the heat as the temperature gets lower. Someone on this forum posted how Citrus growers actually overhead water during freezing spells and this creates a protective layer of ice which prevents damage to the interior of the canopy. In reality, I think most of us growing mango in marginal climates will use mulch and just leave it there at the risk of holding in the heat at night and blocking heat in the day. Sounds like it would be best practice to clear the mulch in Winter but that's also when I hibernate. let me get this straight....so you concluded from your 2 year old 3' Carrie that mangos in socal do exceptionally well and are very reliable? I've been reading you all for a few weeks now, and this is my first post in this forum. This topic is specially interesting for me -thank you Simon and rest of members sharing so useful info- since I live in southern Spain, in the coast of Mediterranean Sea and climatic and soil conditions are pretty similar to those of SoCa. In my particular case I do not have trouble with cold since absolute minims here almost never go below 4ºC (39ºF) but I do have the same problems as you with high pH and extremely dry summers. Here it stops raining in June and keeps like this at least until September, but lately I'm noticing that the dry season is getting longer, starting in May the last years. Regarding rootstocks as you all probably know by other members from my country, the most popular here is Gomera 3, with a good resistance to limestone soils and cold temperatures, and very high resistance to Pseudomonas. Another one with even greater resistance to very high pHs is 13/1 from Israel, available here just in one place as far as I know. This one is a good choice when pH and space are a problem, because is little vigorous. I found very interesting the advice to let the trees grow until they get the size enough to bear fruit. I gonna have the trouble described in this topic since my 3 mangos are all drafted in the traditional way. One of them, a Sensation, I'm thinking now of removing the scion and let the Gomera 3 of the rootstock grow free. The other two (a Keitt and a NDM 4) I'll probably let them be and see what happens. For the other varieties I wanted to plant (LZ, ST, CC, Maha, PPK) I'm thinking after reading this topic that the most practical way to go could be to look for seeds instead of scions. Seeds should resist better the shipping process and I just would have to select the clon seedling in order to graft it in a Gomera 3 or a 13-1. Thanks everybody for sharing so useful info! "Some varieties like Sweet Tart, Valencia Pride, Alphonso and a few others grows fairly well on Florida rootstock. " Add to Simon's list, I found Edward also is doing great with Florida rootstock in Socal. No, my two trees that i have had here in The ground are about 5-6 years old now. The 3 foot tree is a natural dwarf, and it chosen a low growth habit. The other tree s much larger, about ten feet now. I have also seen other mango trees in the neighborhood. Some specimens quite large, and much more developed than my trees. I generally like to trust what i see, and can personally experience. I have had failures here with plants, but never with mangos. We also have Keitt mango groves in Thermal. And it has been known to freeze in Thermal. Can you give some details on your irrigation practices for your mangos, and also the irrigation practices of the commercial groves out by you if you know them? I am not familiar with the irrigation practices of the commercial growers in Thermal. As for where i am at, we are a little warmer than Thermal, and it has never frosted here in the 8 years i have been in this location. It has gotten into the low 30's. I don't give the trees any special treatment to the trees. I do run sprinklers for about a minute at night before it gets cool at night, but the trees are not mulched or covered at all. I also have Plumeria trees in the same area as the mango trees and they are not given special protection either. Have you meet Gary a senior member of his forum? He lives in Palm Springs and his accounts are quite different than yours so all of us know that growing mangos in SoCal as easy as you make it out be. He has survey his area for mango trees and has seen no more than a handful of mature seedling trees. Mango seedling seems to do well in SoCal grafted trees are another story they take a long time to get establish .... I trust senior members of this forum and their research. I do not know Gary. I will say that Palm Springs is a different beast entirely. They have horrific winds which are very damaging to trees. They make it very hard for trees to keep their flowers. All of trees are grafts. I dont have any seedlings. If i did live in Palm Springs, mangoes would be very difficult to grow im sure, but then again so would most everything else. My experience has been mangoes are very resilient to the heat, and they can take a dair amount of cold. I know what i know, no one has to believe me.